CROWN HEIGHTS — At 15 months, Zahara Shabazz isn't much of a talker. Neither is 11-month-old Zippy, or her peer Soleil. 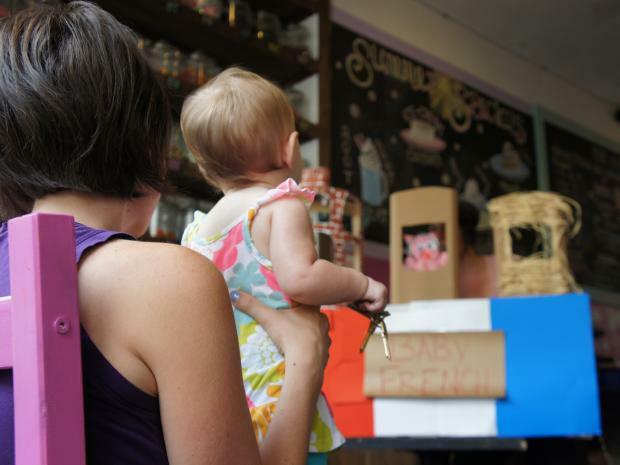 But that hasn't stopped their moms Rashida Bumbray, Zohar Hicks and Faith Ramsey from joining the growing group of parents who tote their tots to Baby French, a new class at The Candy Rush on Franklin Avenue. "I'm one of those moms that said she's going to do this and that and everything else," said Naila Daaj, who brought her 9-month-old daughter Monira Lucas to Tuesday morning's class. "I want her to experience as much as possible and also for her to hear the way the language sounds so she can pick it up later." Although few Baby French students have spoken their first words, scores of studies show that early exposure to a second language echoes later in life, when it can make acquiring new languages that much easier. "I think it's great," Bumbray said. "I think the earlier the better." On Tuesday, the babies gurgled and cooed through a puppet show of "Les Trois Petit Cochons" (The Three Little Pigs), sang "Frère Jacques" and read "L'Ours à la Maison" (The Bear at Home) — all in French. "It’s really good to start those pathways forming at a very early age," said Lyndsey St. John, 28, a Montessori-trained teacher who started the class this summer after talking with local parents who were looking for more ways to engage their very young children. "Anywhere from 8 months to 3 years is when children are really sponges," St. John added. "They’re picking up everything." They certainly do like to pick things up. Tumbling around the brightly colored candy shop, the babies latched onto everything from lollipops to St. John's furry loup — that's wolf, for the uninitiated. "['The Three Little Pigs'] is his favorite story right now," said Ramsey of her 3-year-old son Liam, who already speaks French at home. "He's pretty fixated on that wolf." Though only two of the families spoke French, all of them agreed it was something they hoped would enrich their children's multicultural Brooklyn upbringing. "I think it opens their minds to other cultures," St. John said. "It's really important for us to have a multicultural understanding and raise our kids that way, too." Baby French is held every Tuesday at 11 a.m. at Candy Rush on Franklin Avenue between Sterling Place and Park Place in Crown Heights.